Want to get your young ones out of the house for an hour or two? 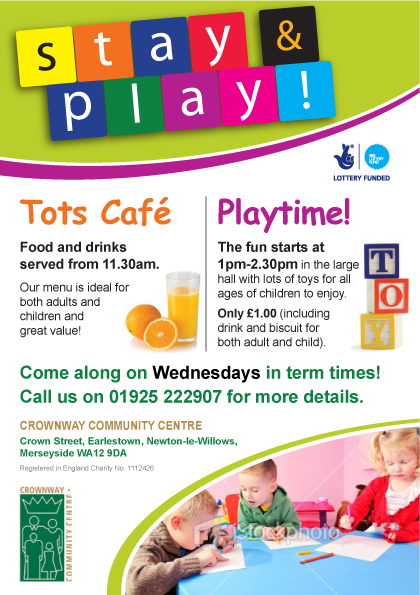 Come along to Crownway’s Tots Cafe where we have a special menu serving a range of meals, snacks and drinks for your toddlers. Runs from 11.30am – 12.30pm every Wednesday during term times within our Crownway Café where we have menus for both adults and children at great value! The fun starts every Wednesday 1.00pm – 2.30pm during term times in our large spacious Hall. Lots of fun and interactive toys available to keep your pre-school child engaged and interested. Only £1.00 per child (including a drink, fruit and biscuit snack for both adult & child). No need to book a place, just turn up! A chance for parents, child-minders, or guardians to sit and chat and share their experiences while keeping their children entertained and active.